1.) 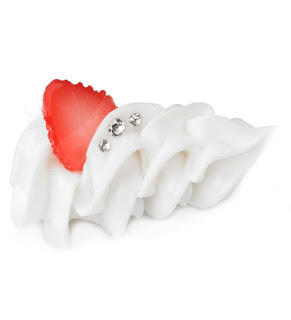 For the Miss Havishams in your life: Q-Pot's Japanese surrealist Strawberry Whip Brooch is the perfect avant-garde accessory for adorning a scarf, a lapel, or a tote bag. Fun and whimsical, this fluffy cloud of whipped cream looks good enough to eat. 2.) 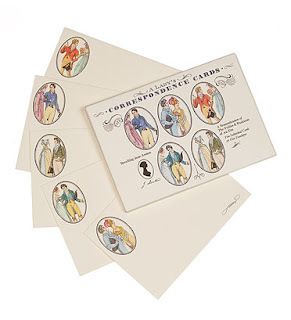 For the friend who has everything: A Lady's Correspondence Cards might just be the one thing that she doesn't already own and will allow her to write thank-you-notes for all the other gifts she's acquired. With illustrations that appear to be straight out of Pride & Prejudice, don't be surprised if you think that you recognize Mr. Darcy or Elizabeth on one of your thank-you-notes. 3.) 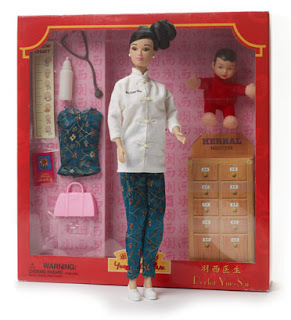 For the precocious urban toddler: This Dr. Yue-Sai Wa Wa Doll is quite possibly the coolest non-blonde Barbie ever. She comes equipped with the accoutrements necessary to practice Chinese medicine as well as to indulge in a longevity-promoting green tea break. The perfect role model for the youngster who's bored with the Madame Alexander scene. 4.) 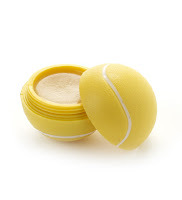 For the innovative gift-giver: Bet she's never seen or heard of Tennis Ball Lip Balm (with vanilla and SPF). This is definitely one of the coolest lip balm packages I've ever seen. She's sure to get comments and questions along the lines of, "Where did you get that?" And natch you'll get the credit. Extra points if she's a tennis fan. wooah...I like this doll! Even though I'm an precocious urban adult...young adult...regular adult? Who can judge?